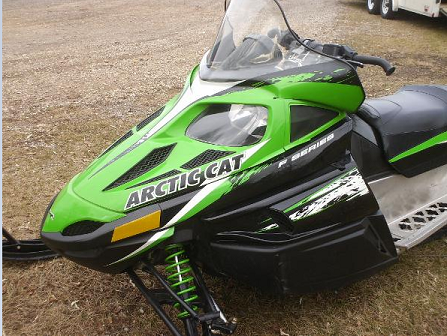 Between November, 2017, and April, 2018, a green and black 2010 Artic Cat F5LXR (similar to the snowmobile in the picture) was stolen from a property located in the RM of Two Borders, in Manitoba. The snowmobile has an aftermarket exhaust, and a crack in the front cowling, and it is believed the snowmobile may currently be in the Carievale, Saskatchewan area. Anyone with information about the theft of this snowmobile, is asked to call the Virden RCMP Detachment at (204) 748-2046, or submit a tip.